Laredo Ridge Wind Farm hosted a safety workshop for Petersburg Fire and Rescue personnel last Wednesday, Sept. 24, dealing with suspension trauma. The hands-on training began at 10:30 a.m. with a mock call for assistance at tower #15. 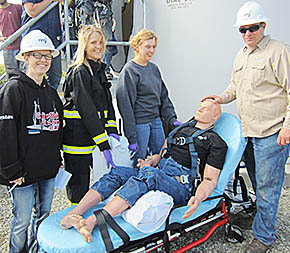 The scenario was a 200-pound victim (mannequin) secured in a safety harness, suffered heat exhaustion and needed extraction from inside the tower and transport. Rescue squad members met Monday, Sept. 29, with Dr. Shawn Kohl to discuss this procedure, along with other issues, and for recertification. Fire Chief Boomer Baumgartner and fireman Ken Henn assisted in helping lift the victim inside the tower.